This theme is a WordPress theme. It means you first install WordPress and then you install the Premiumpress classifieds theme. This theme comes with everything that you need to start a classifieds website like a classifieds layout, registration form, registration, add a listing page, payment gateway connections. Since it is a WordPress theme, the Premium classifieds theme uses all the WordPress features. It uses the user registration, user role, category feature, posts, pages. To build a page Premiumpress uses the Elementor page builder. It means that you use Elementor to build your homepage using regular blocks from Elementor, default WordPress widgets, WordPress plugin widgets and also classified theme blocks from Premiumpress. The actual theme is a flat design theme so that it looks modern and it does not take too much storage which is good for bandwidth. You can add, modify and delete classifieds categories and sub-categories using the WordPress category features. You can add a small image, a big image and a text icon to every category. By default, the main category contains all the classifieds ads from the subcategories. The premiumpress default theme counts 3 category layouts. Unfortunately, they only show the main categories without subcategories. The listing page looks modern because it is part of a flat design theme. There aren’t too much graphics that could make the page file size too heavy. 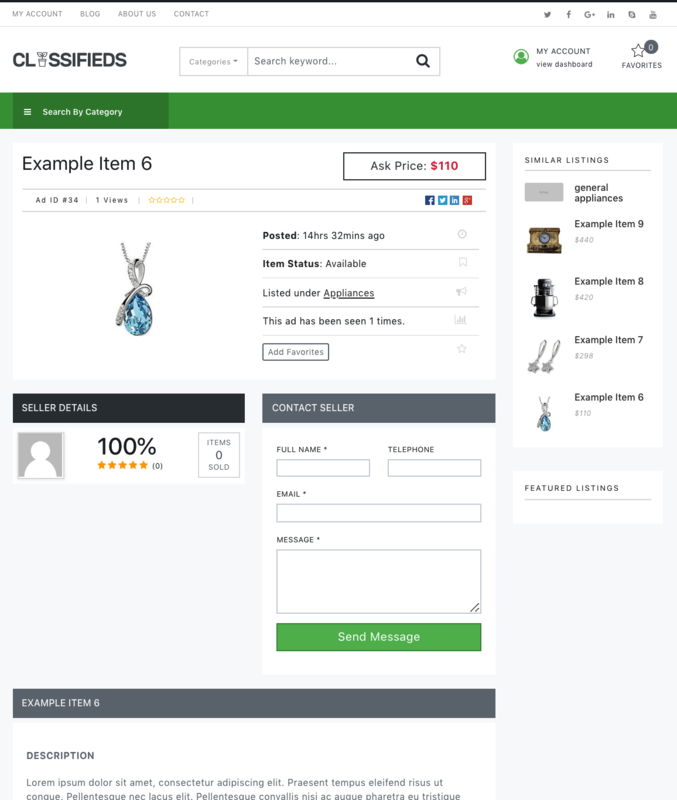 The listing page includes a picture, the ad timestamp, item status, category, a contact form to send a message to the seller so that the seller does not need to disclose his/her email address or phone number, an item description. What you see below is the default layout of a listing page. It is possible to modify this listing page by using a child theme or modifying the CSS style. This is what you would do with any WordPress themes. The Premiumpress classifieds theme is delivered with a pre-installed embedded Paypal payment module but you can also install other modules from the theme itself. For example, you can install STRIPE, autorize.net, sage pay, Braintree, worldpay, Payflow, Payza, payumoney. You don’t need to buy those modules or look for those modules because they are optional modules of the default theme. The Premiumpress classifieds theme is perfect if you want to build a classifieds website with paid ads that should be ready out-of-the-box. With the Premiumpress classifieds theme, you don’t need to buy additional plugins for the payment gateway or the listing features. The homepage blocks options are limited but you can also customize the theme with PHP or you can hire an official partner programmer of Premiumpress. Since the Premiumpress classified theme does not require any 3rd party plugin or heavy modification to work, you can start with the default installation and modify it afterward.